Justin Bieber, Skrillex & Diplo soaring to No. 1 on Billboard’s Dance/Electronic Streaming Songs chart with “Where Are U Now” (4-1). It’s the first leader on the list for all three artists. “Where” racked up 3.9 million U.S. streams, led by 64 percent from Spotify, in the week ending April 12, according to Nielsen Music. Justin has been consistently promoting the track, singing it during a surprise appearance at an Ariana Grande concert in Los Angeles on April 8, as well as performing it with Skrillex during the DJ’s March 29 set at Miami’s Ultra Music Festival. “Where Are U Now” also soars 4-2 on Dance/Electronic Digital Songs (45,000 downloads sold, up 36 percent). The track zooms 64-42 on the Billboard Hot 100, where it’s the highest-charting hit for both Skrillex and Diplo. 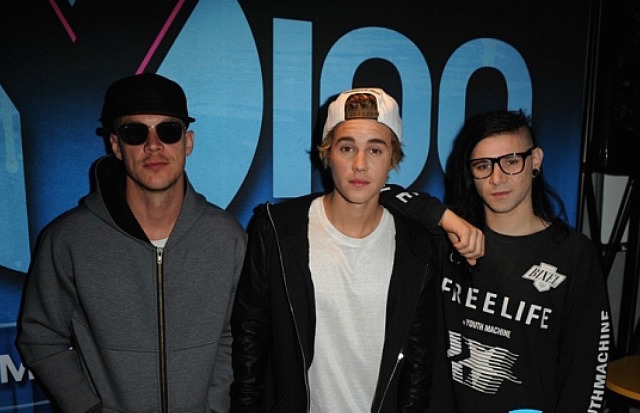 “It’s Expensive!” Justin Bieber, Diplo & Skrillex Talk Producing “Where Are U Now” – WATCH VIDEO!